Definition at line 11 of file stdio.h. Definition at line 507 of file stdio.h. Definition at line 445 of file stdio.h. Definition at line 1041 of file stdio.h. Definition at line 1118 of file stdio.h. Definition at line 38 of file stdio.h. Definition at line 112 of file stdio.h. Definition at line 117 of file stdio.h. Definition at line 1119 of file stdio.h. Definition at line 1120 of file stdio.h. Definition at line 1122 of file stdio.h. Definition at line 1110 of file stdio.h. Definition at line 1124 of file stdio.h. Definition at line 23 of file stdio.h. Definition at line 133 of file stdio.h. Definition at line 134 of file stdio.h. Definition at line 128 of file stdio.h. Definition at line 129 of file stdio.h. Definition at line 132 of file stdio.h. Definition at line 130 of file stdio.h. Definition at line 125 of file stdio.h. Definition at line 136 of file stdio.h. Definition at line 135 of file stdio.h. Definition at line 126 of file stdio.h. Definition at line 21 of file stdio.h. Definition at line 22 of file stdio.h. Definition at line 89 of file stdio.h. Definition at line 80 of file stdio.h. Definition at line 78 of file stdio.h. Definition at line 45 of file stdio.h. Definition at line 1121 of file stdio.h. Definition at line 1123 of file stdio.h. Definition at line 1109 of file stdio.h. Definition at line 1125 of file stdio.h. Definition at line 1115 of file stdio.h. Definition at line 105 of file stdio.h. Definition at line 66 of file stdio.h. Definition at line 139 of file stdio.h. Definition at line 137 of file stdio.h. Definition at line 46 of file stdio.h. Definition at line 1112 of file stdio.h. Definition at line 20 of file stdio.h. Definition at line 24 of file stdio.h. Definition at line 64 of file stdio.h. Definition at line 65 of file stdio.h. Definition at line 1107 of file stdio.h. Definition at line 1100 of file stdio.h. Definition at line 49 of file stdio.h. Definition at line 73 of file stdio.h. Definition at line 1217 of file stdio.h. Definition at line 1108 of file stdio.h. Definition at line 1101 of file stdio.h. Definition at line 56 of file stdio.h. Definition at line 57 of file stdio.h. Definition at line 58 of file stdio.h. Definition at line 710 of file stdio.h. Definition at line 108 of file stdio.h. Definition at line 62 of file stdio.h. Definition at line 106 of file stdio.h. Definition at line 60 of file stdio.h. Definition at line 107 of file stdio.h. Definition at line 61 of file stdio.h. Definition at line 1218 of file stdio.h. Definition at line 67 of file stdio.h. Definition at line 707 of file stdio.h. Definition at line 732 of file stdio.h. Definition at line 1058 of file stdio.h. Definition at line 81 of file stdio.h. Definition at line 37 of file stdio.h. Definition at line 83 of file stdio.h. 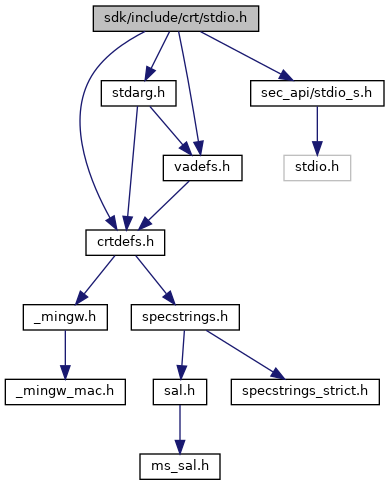 Referenced by _tWinMain(), ConStreamSetOSHandle(), and FTPRebuildConnectionInfo(). Referenced by ConStreamGetOSHandle(), ConWrite(), DllMain(), CCabinet::GetFileTimes(), GetPass(), File::length(), loadFile(), main(), PageCmd(), and REGPROC_open_export_file(). Definition at line 2 of file ofmt_stub.c. Definition at line 5 of file stubs.c. Referenced by vfprintf(), vfprintf_s(), vfwprintf(), and vfwprintf_s(). Referenced by _tmain(), ForF(), recvrequest(), sendrequest(), and test__popen(). Referenced by _tmain(), recvrequest(), sendrequest(), test__popen(), and Test_popen(). Referenced by BuildUserModeWindowStationName(), and IntResolveDesktop(). Definition at line 718 of file sprintf.c. Referenced by _scprintf(), ATL::ChTraitsCRT< char >::FormatV(), PrintMessageAnsi(), and VddDbgMsg(). Referenced by _scwprintf(), BestFit_Write(), DisplayMessage(), ATL::ChTraitsCRT< _CharType >::FormatV(), and InfoMessageBox(). Definition at line 386 of file sprintf.c. Referenced by _snprintf(), sprintf(), and vsprintf(). Referenced by _vsnwprintf_wrapper(), call_varargs(), DisplayMessage(), error(), FormatBox(), FormatMsg(), InfoMessageBox(), my_swprintf(), PrintStringV(), RtlStringVPrintfExWorkerW(), RtlStringVPrintfWorkerW(), string_error::string_error(), StringVPrintfExWorkerW(), StringVPrintfWorkerW(), vsnwprintf(), warning(), and wstring_sprintf(). Referenced by compat_fopen(), do_update_base(), DoEntry(), DosBIOSInitialize(), ImportRegistryFile(), LoadBootIni(), LoadSystemIni(), PerformRegAction(), ReadFromFile(), reg_import(), RunScript(), wmain(), wWinMain(), and XCOPY_ProcessExcludeFile(). Referenced by LoadIniFile(), and WriteIniFile(). Referenced by __CloseHandle(), _Filebuf_base::_M_close(), _pclose(), abort(), CCabinet::AddFile(), bsClose(), BZ2_bzclose(), bzopen_or_bzdopen(), check_atari(), check_bitmap_data(), check_file_size(), check_for_files(), CheckForNewV3User(), cleanReq(), cleanUpAndFail(), File::close(), CCabinet::Close(), close_backing_store(), close_file(), close_log_files(), close_merge_image(), CloseBookmarkFile(), CloseF(), CloseFile(), CloseTrace(), CCabinet::CommitDisk(), compare_export_(), compat_fclose(), compress(), compressStream(), config_load(), copyfont(), create_cache(), create_nls_file(), create_output_file(), create_sic(), CreateCaseDiff(), CreateSpecFile(), DbgHelpAddLineNumber(), CCFDATAStorage::Destroy(), disk_cleanup(), DllMain(), do_import(), do_update_base(), DoEntry(), DoParsing(), DosBIOSInitialize(), EndLog(), endnetconfig(), endrpcent(), errconfig(), error_exit(), export_registry_key(), ExportBinaryHive(), extract_test(), CCabinet::ExtractFile(), fclose_file_func(), figurefiletype(), file_exists(), fileClient(), fileExists(), ForF(), gen_add_list(), Generate(), generate_xa_rr_attributes(), get_ImageBase(), get_list_blocks(), get_subtests(), getICMPStats(), getnetconfigent(), getnetid(), GetOurHostName(), getpublicandprivatekey(), getSection(), gl_check_inputrc_for_vi(), gl_histloadfile(), gl_histsavefile(), import_certs_from_file(), ImportRegistryFile(), InfHostOpenFile(), InfHostWriteFile(), init(), init_leases_list(), init_logger_addr(), TScript::initScript(), kbd_c(), kbd_def(), kbd_h(), kbd_rc(), CDFParser::Load(), Load_CP2Unicode_Table(), load_file(), Load_OEM2Unicode_Table(), LoadBootIni(), loadFile(), LoadFile(), tinyxml2::XMLDocument::LoadFile(), LoadFirewallPrefs(), LoadIniFile(), LoadPrefs(), LoadSystemIni(), log_file(), logMess(), logmsg(), LogOpen(), LogXfer(), main(), MainWndProc(), myClose(), nls_from_txt(), OpenBookmarkFile(), openSection(), OpenTmpBookmarkFile(), parse_switches(), parseAndPrintFile(), TANSIParser::ParseEscapeANSI(), pass(), PerformRegAction(), pop_import(), TANSIParser::PrintBuffer(), processRequest(), PutBookmark(), read_cache(), read_file(), read_input_file(), read_JPEG_file(), read_mbr_template(), read_quant_tables(), read_rcfile(), readAllPolygons(), readconfig(), ReadFromFile(), readSection(), recvrequest(), reg_import(), regscan(), remglob(), RunBookmarkEditor(), RunScript(), ruserpass(), saveFile(), tinyxml2::XMLDocument::SaveFile(), SavePrefs(), SdbCloseDatabase(), select_file_name(), send_file(), sendrequest(), ServiceMain(), set_LogFile(), CCabinet::SetCabinetReservedFile(), SpoolX(), START_TEST(), switch_to_acf(), FstreamTest::tellp(), test___getmainargs(), test___getmainargs_parent(), test_file_truncate(), test_fprintf(), test_searchenv(), testStream(), CCFDATAStorage::Truncate(), txt_get_glyph_table(), txt_get_header(), txt_get_mb_table(), txt_get_wc_table(), uncompress(), uncompressStream(), unpack_iso(), updateSvnlog(), verify_output_file(), wmain(), wpp_default_close(), write_casemap_file(), write_client(), write_dlldata(), write_dlldata_list(), write_header(), write_id_data(), write_if_change(), write_JPEG_file(), write_local_stubs(), write_one_file(), write_proxies(), write_regscript(), write_server(), directedLine::writeAllPolygons(), CCabinet::WriteFileToScratchStorage(), WriteIniFile(), XCOPY_ProcessExcludeFile(), xkeymap_from_locale(), xkeymap_read(), xmlMemDisplay(), xmlMemDisplayLast(), xmlMemoryDump(), xsltDocumentElem(), CDFParser::~CDFParser(), FileReporter::~FileReporter(), and TANSIParser::~TANSIParser(). Referenced by _fcons(), bzopen_or_bzdopen(), compat_fdopen(), do_import(), fopen_output_safely(), import_certs_from_file(), main(), OpenControlConnection(), read_stdin(), switch_to_acf(), test_fdopen(), test_fileops(), test_pipes(), test_readmode(), and write_stdout(). Referenced by _tmain(), cmdscanner(), dumpHex(), dumpStr(), File::eof(), get_list_blocks(), init_leases_list(), LoadBootIni(), LoadIniFile(), LoadSystemIni(), main(), processRegLines(), processRegLinesA(), processRegLinesW(), read_header_file(), readline(), token(), and XCOPY_ProcessExcludeFile(). Referenced by BZ2_bzRead(), BZ2_bzReadOpen(), BZ2_bzWrite(), BZ2_bzWriteClose64(), BZ2_bzWriteOpen(), check_file_size(), cmdscanner(), compressStream(), copyfont(), create_output_file(), ferror_file_func(), filewrite(), gl_file(), tinyxml2::XMLDocument::LoadFile(), main(), printer_write(), printline(), printusage(), processRegLines(), processRegLinesA(), processRegLinesW(), read_mbr_template(), read_rcfile(), recvrequest(), sendrequest(), test_file_truncate(), testStream(), TRIO_ARGS2(), uncompressStream(), verify_output_file(), wmain(), and write_dlldata(). Referenced by alarm_intr(), bsClose(), BZ2_bzWriteClose64(), cd(), cdup(), check_blocks(), cmdabort(), cmdscanner(), CmpFileFlush(), command(), compress(), compressStream(), confirm(), dataconn(), delete(), disk_ioctl(), do_chmod(), domacro(), domap(), doproxy(), dprintf(), eprintf(), Error(), fsetmode(), get_key(), GetCmd(), getit(), GetPass(), getreply(), globulize(), help(), hookup(), initconn(), InputChar(), InteractiveConsole(), lcd(), LocalListCmd(), log_debug(), log_hexdump(), login(), logMess(), ls(), macdef(), main(), makedir(), mdelete(), mget(), mls(), modtime(), MonitorChildThread(), mput(), NcFTPConfirmResumeDownloadProc(), NcFTPConfirmResumeUploadProc(), newer(), OpenMsg(), OpenPager(), stdio_ostreambuf::overflow(), PrintF(), PrintStartupBanner(), PromptForBookmarkName(), proxtrans(), PrPhilBar(), PrStatBar(), ptransfer(), put(), PutCmd(), pwd(), query_done(), quote(), recvrequest(), remglob(), removedir(), rename_file(), renamefile(), restart(), rewrite_client_leases(), SaveCurrentAsBookmark(), SaveUnsavedBookmark(), sendrequest(), SendTelnetInterrupt(), serial_create(), setbell(), setcase(), setcr(), setdebug(), setform(), setglob(), sethash(), setnmap(), setntrans(), setpassive(), setpeer(), setport(), setprompt(), setrunique(), setstruct(), setsunique(), settrace(), settype(), setverbose(), shell(), site(), sizecmd(), START_TEST(), status(), stdio_streambuf_base::sync(), testf(), uncompress(), uncompressStream(), usage(), user(), wintirpc_debug(), write_client_lease(), write_one_file(), WriteBmLine(), xdrstdio_destroy(), FileReporter::~FileReporter(), and stdio_streambuf_base::~stdio_streambuf_base(). Referenced by dumpHex(), dumpStr(), fileClient(), File::get(), tinyxml2::XMLDocument::LoadFile(), main(), myfeof(), processRegLinesA(), translate_files(), TRIO_ARGS2(), stdio_istreambuf::uflow(), and stdio_istreambuf::underflow(). Referenced by _tmain(), AnalyzeFile(), applyPatch(), check_atari(), CheckForNewV3User(), config_load(), create_cache(), create_sic(), CreateCaseDiff(), EndLog(), FGets(), fgetws(), find_str(), gen_add_list(), get_pnames(), getICMPStats(), File::getline(), getnetconfig(), getnetconfigent(), getnetid(), GetOurHostName(), getpublicandprivatekey(), getRevision(), getrpcent(), getSection(), gl_check_inputrc_for_vi(), gl_histloadfile(), import_base64_certs_from_fp(), init_logger_addr(), InteractiveConsole(), Load_CP2Unicode_Table(), Load_OEM2Unicode_Table(), LocalListCmd(), log_file(), login(), main(), NcFTPConfirmResumeDownloadProc(), NcFTPConfirmResumeUploadProc(), NextLine(), openSection(), ProcessFirewallPrefFile(), ProcessPrefsFile(), read_cache(), read_header_file(), read_password(), read_rcfile(), Readline(), readline(), readSection(), regscan(), remglob(), rename_file(), SaveCurrentAsBookmark(), SaveUnsavedBookmark(), test__popen(), test_fprintf(), Test_popen(), translate_files(), txt_get_glyph_table(), txt_get_header(), txt_get_mb_table(), txt_get_wc_table(), updateSvnlog(), user(), widl_getline(), and xkeymap_read(). Referenced by _io_get_my_flag(), _io_set_my_flag(), _Filebuf_base::_M_open(), _more_flags(), chmc_init(), chmc_term(), compress(), compressStream(), ffileread(), filewrite(), File::length(), main(), printer_create(), read_stdin(), readsecs(), recvrequest(), ruserpass(), sendrequest(), test_write_flush_size(), testf(), uncompress(), uncompressStream(), WaitResponse(), and write_stdout(). Referenced by CCabinet::AddFile(), bzopen_or_bzdopen(), tinyxml2::callfopen(), check_atari(), check_bitmap_data(), check_for_files(), CheckForNewV3User(), CCabinet::CommitDisk(), compare_export_(), compat_fopen(), compress(), config_load(), copyfont(), CCFDATAStorage::Create(), create_cache(), create_nls_file(), CreateCaseDiff(), DbgHelpAddLineNumber(), disk_openimage(), do_import(), DoEntry(), EndLog(), ExportBinaryHive(), extract_test(), CCabinet::ExtractFile(), figurefiletype(), file_exists(), fileClient(), fileExists(), FileReporter::FileReporter(), fopen_file_func(), fopen_output_safely(), gen_add_list(), Generate(), generate_xa_rr_attributes(), get_ImageBase(), get_list_blocks(), get_subtests(), getICMPStats(), getnetconfigent(), getnetid(), GetOurHostName(), getpublicandprivatekey(), getrpcent(), getSection(), gl_check_inputrc_for_vi(), gl_histloadfile(), gl_histsavefile(), InfHostOpenFile(), InfHostWriteFile(), init(), init_client(), init_leases_list(), init_logger_addr(), init_proxy(), init_server(), TScript::initScript(), jpeg_open_backing_store(), kbd_c(), kbd_def(), kbd_h(), kbd_rc(), CDFParser::Load(), Load_CP2Unicode_Table(), load_file(), Load_OEM2Unicode_Table(), loadFile(), LoadFile(), LoadFirewallPrefs(), LoadPrefs(), log_file(), logMess(), logmsg(), LogOpen(), LogXfer(), main(), MainWndProc(), nls_from_txt(), File::open(), CCabinet::Open(), open_log_files(), open_merge_image(), OpenBookmarkFile(), OpenF(), openSection(), OpenTmpBookmarkFile(), OpenTrace(), parse_switches(), parseAndPrintFile(), TANSIParser::ParseEscapeANSI(), pass(), pfopen(), processRequest(), read_cache(), read_file(), read_input_file(), read_JPEG_file(), read_mbr_template(), read_quant_tables(), read_rcfile(), readAllPolygons(), readconfig(), recvrequest(), REGPROC_open_export_file(), regscan(), remglob(), rewrite_client_leases(), RunBookmarkEditor(), ruserpass(), saveFile(), SavePrefs(), SdbpCreate(), select_file_name(), send_file(), sendrequest(), set_LogFile(), CCabinet::SetCabinetReservedFile(), setnetconfig(), setrpcent(), SpoolX(), START_TEST(), switch_to_acf(), TANSIParser::TANSIParser(), FstreamTest::tellp(), test___getmainargs(), test___getmainargs_parent(), test_fprintf(), test_searchenv(), testf(), txt_get_glyph_table(), txt_get_header(), txt_get_mb_table(), txt_get_wc_table(), uncompress(), unpack_iso(), updateSvnlog(), wintirpc_debug(), wpp_default_open(), write_casemap_file(), write_client_lease(), write_dlldata(), write_dlldata_list(), write_header(), write_id_data(), write_if_change(), write_JPEG_file(), write_local_stubs(), write_one_file(), write_regscript(), directedLine::writeAllPolygons(), CCabinet::WriteFileToScratchStorage(), CDFParser::WriteInfLine(), xkeymap_open(), xmlMemDisplay(), xmlMemDisplayLast(), xmlMemoryDump(), and xsltDocumentElem(). Referenced by __report_error(), __rpc_broadenable(), __rpcb_findaddr_timed(), __xprt_do_unregister(), _amsg_exit(), _assert(), _chm_decompress_block(), _getgroups(), _getopt_internal(), _svcauth_gss(), _TIFFPrettyPrintField(), _TIFFprintAsciiBounded(), _TIFFprintAsciiTag(), _TIFFPrintField(), _TIFFPrintFieldInfo(), _vwarnx(), aargh(), abort(), add_cache(), add_expand_text(), add_hash(), adns__vdiag(), adnsfail(), arg_get_long(), arg_get_utf8(), assign_file_addresses(), assign_stub_out_args(), attributeDeclDebug(), authgss_create(), authgss_create_default(), authgss_destroy(), authgss_validate(), BackToTop(), bezierPatchMeshMake(), bezierPatchMeshNumTriangles(), bezierPatchMeshPutPatch(), buffered_fullread(), build_huffman_tree(), build_tree(), byte_till_end(), BZ2_bz__AssertH__fail(), cadvise(), cdataBlockDebug(), charactersDebug(), chat(), check_cache(), check_entropy(), check_for_files(), check_lame_tag(), CheckForNewV3User(), checkRecv(), CheckTestFile(), chmc_add_entry(), chmc_crunch_lzx(), chmc_section_create(), cleanUpAndFail(), clear_output_vars(), ClickProc(), clnt_cb_thread(), clnt_pcreateerror(), clnt_perrno(), clnt_perror(), clnt_vc_create(), clnt_vc_destroy(), CloseTrace(), CommandShell(), commentDebug(), compress(), compressedStreamEOF(), compressStream(), configError(), configparseerr(), ConvertCoffs(), convertHexCSVToHex(), convertHexToDWord(), ConvertStabs(), copyFileName(), copyfont(), crcError(), create_cache(), CreateOutputFile(), CreateSpecFile(), CreateTestDir(), CreateTestFile(), directedLine::cutoffPolygon(), dataconn(), DBG_check(), DbgHelpAddLineNumber(), DbgHelpAddStringToTable(), debug_error(), declare_stub_args(), decode_header(), decode_the_frame(), decodeA(), delete_registry_key(), die(), disk_enum_devices(), display_dhcp_packet(), do_layer2(), do_rva(), do_test(), do_write_c_method_def(), DoDllRegisterServer(), DoDllUnregisterServer(), DoRegServer(), DoService(), DoUnregServer(), dprintf(), dump_tree(), dump_var_desc(), DumpCharacterFontData(), DumpFont(), dumpHex(), dumpStr(), dumptype(), DwExecIntruction(), elementDeclDebug(), encodeA(), FileReporter::end(), end_cplusplus_guard(), endDocumentDebug(), endElementDebug(), endElementNsDebug(), OpenGLSurfaceEvaluator::endmap2f(), endnetpath(), entityDeclDebug(), eprintf(), FileReporter::error(), Error(), error(), ErrorExit(), ErrorHook(), Slicer::evalStream(), ewmh_get_window_desktop(), ExecuteKill(), ExecuteTest(), expand_define(), expand_macro(), expand_special(), export_hkey(), export_registry_key(), externalSubsetDebug(), failure_errno(), failure_status(), fatal_error(), figurefiletype(), file_write(), fileClient(), fill_boot_desc(), find_lease(), find_match_at(), find_or_create_directory(), FindFonts(), fputcSocket(), fputSocket(), frame_buffercheck(), frame_cpu_opt(), free_variable(), fs_flush(), FTC_MruNode_Prepend(), FTC_MruNode_Remove(), FTC_MruNode_Up(), FTPPerror(), gen_proxy(), gen_stub(), gen_stub_thunk(), Generate(), generate_one_directory(), generate_xa_rr_attributes(), generic_msg(), get_current_desktop(), get_current_workarea(), get_property_value(), getbits(), getclnthandle(), GetCmd(), getEntityDebug(), GetExportsFromFile(), getnetconfig(), getnetconfigent(), getnetid(), Getopt(), getopt(), getpacket(), getParameterEntityDebug(), getpublicandprivatekey(), gl_histsavefile(), gluNurbsSurface(), hasExternalSubsetDebug(), hasInternalSubsetDebug(), help(), HexDump(), hookup(), ignorableWhitespaceDebug(), III_get_side_info(), indent(), init_begin(), init_finish(), init_server(), InitConnectionInfo(), InitUserInfo(), insert_file_entry(), internalSubsetDebug(), ioError(), iso_connect(), isohybrid_error(), isohybrid_warning(), isStandaloneDebug(), Jobs(), kbd_c(), kbd_def(), kbd_h(), kbd_rc(), lhash_val_of_name_sys(), LIBXML_ATTR_FORMAT(), license(), ListCmd(), LoadProc(), LocalChdirCmd(), LocalListCmd(), log_debug(), log_hexdump(), login(), logMess(), LogOpen(), LogXfer(), Ls(), Ls1(), LsC(), LsL(), lz_analyze_block(), lz_compress(), lzx_compress_block(), lzx_output_literal(), lzx_output_match(), lzx_write_bits(), lzx_write_compressed_literals(), lzx_write_compressed_tree(), macro_add_arg(), macro_add_expansion(), main(), make_listening_socket(), MakeArgv(), mallocFail(), MC_sweepY(), merge_remaining_entries(), MergeStabsAndCoffs(), FileReporter::message(), MlsCmd(), mpg123_fmt(), mpg123_fmt_all(), mpg123_fmt_none(), msg(), msg_spy_find_next_msg(), mySignalCatcher(), mySIGSEGVorSIGBUScatcher(), names_dump(), nanox_event(), nc_perror(), netfinger(), next_marker(), normalize(), notationDeclDebug(), OnCreate(), OOM(), OpenBookmarkFile(), OpenCmd(), OpenMsg(), OpenTmpBookmarkFile(), OpenTrace(), out_params(), OutOfMemory(), outOfMemory(), output_message(), Output_stublabel(), OutputError(), OutputHeader_asmstub(), OutputHeader_def(), OutputHeader_stub(), OutputLine_asmstub(), OutputLine_def(), OutputLine_def_GCC(), OutputLine_def_MS(), OutputLine_stub(), pad(), PageCmd(), panic(), parse_arguments(), parse_cmdlineargs(), parse_dhcp_options(), parse_new_id3(), parse_switches(), parseAndPrintFile(), ParseFile(), parsePath(), ParsePEHeaders(), pdie(), pipeClient(), pipeServer(), PlotCharacter(), pop_buffer(), pp_add_macro(), pp_do_include(), pp_internal_error(), pp_pop_if(), pp_push_if(), PredictorPrintDir(), PreInit(), print(), print_access_mask(), print_condwait_status(), print_create_attributes(), print_disconnect_reason(), print_disposition(), print_dnsfail(), print_error(), print_file_id_both_dir_info(), print_hexbuf(), print_hexbuf_no_asci(), print_phase_basetype(), print_rpc_gss_sec(), print_share_mode(), print_sr_status_flags(), print_text_marker(), PrintHosts(), printline(), PrintName(), PrintNameTable(), printopts(), PrintStartupBanner(), FileReporter::printSummary(), PrintUsage(), process_comment(), process_data(), process_dhcp_packet(), process_extra(), process_file(), process_picture(), RequestHandler::process_request(), process_text(), processingInstructionDebug(), processRegEntry(), processRegLinesA(), ProcessRelocations(), processSetValue(), proclog(), FileReporter::progress(), promote_framename(), proxy_free_variables(), PrPhilBar(), PrSizeAndRateMeter(), PrStatBar(), PutBookmark(), PutCmd(), rdp2vnc_connect(), rdpsnd_process_negotiate(), read_frame(), read_header_file(), read_JPEG_file(), read_merging_directory(), read_password(), read_quant_tables(), read_rcfile(), read_stdin(), readError(), recvrequest(), redundant(), referenceDebug(), registerNode(), REGPROC_open_export_file(), REGPROC_print_error(), REGPROC_unescape_string(), release_lease(), resolveEntityDebug(), rpc_broadcast_exp(), WriterThread::Run(), RunBatch(), RunBookmarkEditor(), ruserpass(), SaveCurrentAsBookmark(), SavePrefs(), scan_directory_tree(), search_tree_file(), select_transform(), sendrequest(), SendTelnetInterrupt(), ServeOneClient(), Server(), ServiceCtrlHandler(), ServiceMain(), set_quant_slots(), set_sample_factors(), SetAnonPass(), SetAutoAscii(), SetAutoResume(), SetAutoSaveChangesToExistingBookmarks(), SetConfirmClose(), SetConnTimeout(), SetCtrlTimeout(), setDocumentLocatorDebug(), SetLogSize(), SetNoAds(), SetOneTimeMessages(), SetPager(), SetPassive(), SetRedialDelay(), SetSavePasswords(), SetSOBufsize(), SetStartupURL(), setup_tables(), setValue(), SetXferTimeout(), SetXtermTitle(), SetXtTitle(), showFileNames(), showVersion(), sic_list(), skip_junk(), sort_n_finish(), SpoolGetCmd(), SpoolPutCmd(), SpoolX(), start_cplusplus_guard(), START_TEST(), startDocumentDebug(), startElementDebug(), startElementNsDebug(), StartServiceThread(), sunboot_write(), susage(), svc_getreqset(), svcauth_gss_accept_sec_context(), sweepY(), synth_ntom_set_step(), sysfail(), TCPFree(), TCPMalloc(), test_decodeNameConstraints(), test_fprintf(), testf(), testSAX(), testStream(), textAsk(), textDelta(), textStep(), TIFFPrintDirectory(), TIM_SORT_RESIZE(), tooManyBlocks(), Trace(), try_query_param(), try_start_stop(), tx_compress_dxtn(), ui_create_window(), ui_draw_text(), uncompress(), uncompressStream(), unimpl(), unixErrorHandler(), unixWarningHandler(), unparsedEntityDeclDebug(), UpdateSCMStatus(), RequestHandler::urldec(), usage(), Usage(), usageerr(), user(), userlist(), verr(), verrx(), vwarn(), vwarnx(), WaitForConnect(), warning(), wave_out_close(), wave_out_open(), wave_out_set_format(), wave_out_volume(), wave_out_write(), wetwork(), Win32ErrorHandler(), Win32WarningHandler(), WindowThreadProc(), WinMain(), wmain(), write_args(), write_client_call_routine(), write_client_func_decl(), write_client_ifaces(), write_client_lease(), write_client_routines(), write_clientinterfacedecl(), write_coclass(), write_coclass_forward(), write_com_interface_end(), write_com_interface_start(), write_context_handle_rundowns(), write_cpp_method_def(), write_declaration(), write_dispatchtable(), write_dlldata_list(), write_endpoints(), write_enums(), write_exceptions(), write_expr(), write_expr_eval_routine_list(), write_expr_eval_routines(), write_fields(), write_files(), write_formatstringsdecl(), write_forward(), write_full_pointer_free(), write_full_pointer_init(), write_func_param_struct(), write_function_proto(), write_function_stub(), write_generic_handle_routines(), write_guid(), write_header(), write_header_stmts(), write_id_data(), write_id_guid(), write_if_change(), write_implicithandledecl(), write_import(), write_inline_wrappers(), write_ip_tfs(), write_JPEG_file(), write_library(), write_line(), write_local_stubs(), write_locals(), write_method_macro(), write_method_proto(), write_nonsimple_pointer(), write_one_file(), write_packet(), write_parameter_conf_or_var_exprs(), write_parameters_init(), write_pointer_left(), write_proxy(), write_proxy_routines(), write_remoting_arg(), write_rpc_interface_end(), write_rpc_interface_start(), write_serialize_function(), write_server_stmts(), write_serverinterfacedecl(), write_stdout(), write_stub_methods(), write_stubdescdecl(), write_stubdescriptor(), write_type_definition(), write_type_left(), write_type_right(), write_type_v(), write_typedef(), write_user_quad_list(), write_user_types(), write_uuid_decl(), directedLine::writeAllPolygons(), WriteBmLine(), WriteDefaultFirewallPrefs(), writeError(), WriteTable(), xmlCheckVersion(), xmlDictAddQString(), xmlDictAddString(), xmlDictCreate(), xmlDictCreateSub(), xmlDictGrow(), xmlInitializeGlobalState(), xmllintExternalEntityLoader(), xmlMemDisplay(), xmlMemDisplayLast(), xmlMemShow(), xmlPrintURI(), xprt_register(), xsltDebugDumpExtensions(), xsltDebugDumpExtensionsCallback(), xsltDebugDumpExtModulesCallback(), xsltInitAllDocKeys(), xsltInitCtxtKey(), xsltInitCtxtKeys(), xsltInitDocKeyTable(), xsltPatPushState(), xsltSaveProfiling(), xsltTestCompMatch(), yy_fatal_error(), and yyparse(). Referenced by _TIFFPrettyPrintField(), _TIFFprintAsciiBounded(), configparseerr(), fileClient(), main(), msg(), stdio_ostreambuf::overflow(), TANSIParser::PrintBuffer(), File::put(), textDir(), textOut(), textStatus(), textTag(), TIFFPrintDirectory(), translate_char(), TRIO_ARGS2(), ui_create_glyph(), usage(), write_endpoints(), write_func_param_struct(), write_rundown_routines(), and write_type_v(). Referenced by _getopt_internal(), ios_base::_M_throw_failure(), adns__vdiag(), EndLog(), fdom_split(), GetPass(), LocalListCmd(), main(), poll(), print_dnsfail(), printhelp(), printline(), printusage(), REGPROC_open_export_file(), REGPROC_write_line(), textDelta(), textDir(), textError(), textOut(), textStatus(), textStep(), textTag(), textWarning(), TIFFPrintDirectory(), ui_create_glyph(), Usage(), usage(), usageerr(), and write_if_change(). Referenced by ConWrite(), and main(). Referenced by __MapViewOfFile(), _Filebuf_base::_M_read(), BZ2_bzRead(), CmpFileRead(), compare_export_(), compressStream(), copyfont(), disk_read(), findRev(), fread_file_func(), generate_xa_rr_attributes(), get_ImageBase(), get_lineA(), get_lineW(), get_subtests(), GetBuff(), import_registry_file(), InfHostOpenFile(), CDFParser::Load(), load_file(), loadFile(), LoadFile(), tinyxml2::XMLDocument::LoadFile(), main(), MainWndProc(), myRead(), parseAndPrintFile(), processRegLinesW(), processRequest(), File::read(), read_file(), read_input_file(), read_mbr_template(), CCFDATAStorage::ReadBlock(), CCabinet::ReadBlock(), reg_import(), regscan(), send_file(), CCabinet::SetCabinetReservedFile(), uncompressStream(), wpp_default_read(), write_from_file(), write_if_change(), write_one_file(), write_str_file(), CCabinet::WriteFileToScratchStorage(), xdrstdio_getbytes(), and xdrstdio_getlong(). Referenced by main(), and xfwrite(). Referenced by get_list_blocks(), GetScreenColumns(), init_leases_list(), readAllPolygons(), and test_fprintf(). Referenced by __GetFileSizeEx(), __MapViewOfFile(), _fcons(), CmpFileRead(), CmpFileWrite(), compare_export_(), copyfont(), CreateOutputFile(), disk_ioctl(), disk_read(), disk_write(), ExportBinaryHive(), CCabinet::ExtractFile(), FileSize(), findRev(), fseek_file_func(), get_ImageBase(), GetSizeOfFile(), InfHostOpenFile(), load_file(), LoadFile(), tinyxml2::XMLDocument::LoadFile(), main(), MainWndProc(), CCabinet::Open(), pass(), processRequest(), read_backing_store(), read_file(), read_input_file(), CCabinet::ReadDataBlocks(), CCabinet::ReadFileTable(), CCabinet::ReadString(), recvrequest(), regscan(), File::seek(), CCFDATAStorage::Seek(), send_file(), sendrequest(), updateSvnlog(), write_backing_store(), write_from_file(), write_if_change(), write_one_file(), and xdrstdio_setpos(). Referenced by __GetFileSizeEx(), compare_export_(), disk_ioctl(), FileSize(), ftell_file_func(), GetSizeOfFile(), InfHostOpenFile(), load_file(), LoadFile(), tinyxml2::XMLDocument::LoadFile(), main(), pass(), CCFDATAStorage::Position(), processRequest(), read_file(), read_input_file(), send_file(), FstreamTest::tellp(), test_fprintf(), updateSvnlog(), write_if_change(), xdrstdio_getpos(), and xfwrite(). Referenced by _wperror(), ConWrite(), CreatePerfWindows(), error_unknown_switch(), get_file_name(), main(), tmdump::property_print::operator()(), tmdump::part_print::operator()(), tmdump::class_print::operator()(), PerformRegAction(), ProcessCommandLine(), test_fprintf(), and wWinMain(). Referenced by _Filebuf_base::_M_write(), _RunRemoteTest(), BZ2_bzWrite(), BZ2_bzWriteClose64(), check_bitmap_data(), CmpFileWrite(), CCabinet::CommitDataBlocks(), ConWrite(), copyfont(), create_nls_file(), CreateOutputFile(), disk_ioctl(), disk_write(), do_update_base(), extract_test(), CCabinet::ExtractFile(), filewrite(), flush_buffer(), fwrite_file_func(), InfHostWriteFile(), main(), nls_from_txt(), TANSIParser::ParseBuffer(), pipeClient(), pipeServer(), printer_write(), processRequest(), REGPROC_open_export_file(), REGPROC_write_line(), saveFile(), SdbpFlush(), uncompressStream(), updateSvnlog(), wpp_default_write(), File::write(), write_casemap_file(), write_if_change(), write_lb_ranges(), write_line(), write_regscript(), write_unicode2cp_table(), CCFDATAStorage::WriteBlock(), CCabinet::WriteCabinetHeader(), CCabinet::WriteFileEntries(), CCabinet::WriteFolderEntries(), CDFParser::WriteInfLine(), WriteLine(), WriteOutFile(), xawrite(), xdrstdio_putbytes(), xdrstdio_putlong(), xfwrite(), and xmlBufDump(). Referenced by bsGetBit(), figurefiletype(), GetScreenColumns(), gl_file(), js_fgetline(), main(), recvrequest(), ruserpass(), select_file_type(), sendrequest(), StringGetsExWorkerA(), text_getc(), token(), stdio_istreambuf::uflow(), and stdio_istreambuf::underflow(). Definition at line 3627 of file file.c. Referenced by FSE_normalizeCount(), get_key(), macdef(), Main(), main(), and printWindowsError(). Definition at line 3643 of file file.c. Referenced by cd(), cmdscanner(), confirm(), delete(), do_chmod(), domacro(), doproxy(), getit(), macdef(), main(), makedir(), mdelete(), mget(), mls(), modtime(), mput(), put(), quote(), removedir(), renamefile(), setnmap(), setpeer(), site(), sizecmd(), and user(). Referenced by ADsGetLastError(), check_atari(), check_file_size(), command(), compressedStreamEOF(), count_blocks(), CreateOutputFile(), dataconn(), disk_close(), disk_create(), disk_query_directory(), disk_query_information(), disk_query_volume_information(), disk_read(), disk_set_information(), disk_write(), fs_open(), ftruncate_growable(), Generate(), getit(), hookup(), init_leases_list(), initconn(), ioError(), Jobs(), lcd(), LocalChdirCmd(), LocalMkdirCmd(), LocalRenameCmd(), LocalRmCmd(), LocalRmdirCmd(), main(), MakeDirectory(), MkSpoolDir(), netfinger(), NotifyInfo(), open_tcp_connect(), OpenTmpBookmarkFile(), parallel_create(), ParsePEHeaders(), PerformRegAction(), printercache_mkdir(), printercache_save_blob(), process_data(), processRegLines(), processRegLinesA(), processRegLinesW(), proxtrans(), PutBookmark(), rd_open_file(), rd_pstcache_mkdir(), read_line(), read_pipe(), readError(), recvrequest(), REGPROC_open_export_file(), reset(), rpc_broadcast_exp(), WriterThread::Run(), RunBatch(), ruserpass(), save_licence(), SavePrefs(), sendrequest(), serial_create(), Server(), shell(), ShellCmd(), sock_get_error(), SpoolGetCmd(), SpoolPutCmd(), SpoolX(), subprocess(), test_file_truncate(), verify_output_file(), WaitForRemoteInput(), WaitForRemoteOutput(), wave_out_open(), wave_out_play(), wave_out_set_format(), wave_out_volume(), while(), write_packet(), writeError(), and xstrdup(). Referenced by bsClose(), bsPutBit(), copyfont(), main(), Output(), stdio_ostreambuf::overflow(), print_text_marker(), TANSIParser::PrintGoodChars(), process_COM(), recvrequest(), and usageerr(). Referenced by compare_export_(), FileSize(), main(), rewrite_client_leases(), setrpcent(), and uncompressStream(). Referenced by _tmain(), and main(). Referenced by _fcons(), _Filebuf_base::_M_open(), DllMain(), main(), and set_LogFile(). Referenced by _tWinMain(), fileClient(), main(), OpenTrace(), pipeClient(), processRequest(), and stdio_streambuf_base::setbuf(). Definition at line 762 of file utprint.c. Referenced by __rpc_get_time_offset(), Addhost(), ata_bblk(), cache_entry_create(), check_version(), CheckForNewV3User(), convertHexToDWord(), create_sic(), CRYPT_AsnEncodeOid(), Deletehost(), DissectArcPath2(), doChild(), DoCOMPANY(), DoCOPYRIGHT(), DoDESCRIPTIONS(), DoKBD(), DoKEYNAME(), DoLANGUAGENAMES(), DoLAYOUT(), DoLOCALENAME(), DoSHIFTSTATE(), DoVERSION(), error(), find_typelib_key(), FTP_DoPassive(), FTP_ParseNextFile(), FTPFileSize(), getCharacterInfo(), getit(), GetOptUlong(), getRevision(), GetStartSpoolDate(), getTBRevision(), getVKNum(), handle_address_cmd(), handle_escape_cmd(), initconn(), is_float(), is_guid(), is_integer(), isOffset(), jinit_memory_mgr(), load_persistent_cookie(), main(), match_mod(), modtime(), my_atoi(), netname2user(), ntlm_AcceptSecurityContext(), ntlm_InitializeSecurityContextW(), OpenBookmarkFile(), optionParse(), parse_arguments(), parse_list_response(), parse_reg_reservation(), parse_stat_response(), parse_switches(), parse_uidl_response(), ParseHostLine(), Passive(), regscan(), set_quality_ratings(), set_quant_slots(), set_sample_factors(), SkipLines(), SLTG_DoRefs(), START_TEST(), system_icmp(), Test_ifuncs(), test_listbox_dlgdir(), test_listbox_LB_DIR(), test_retval(), test_strdate(), test_strtime(), TLB_GUIDFromString(), translate_line(), uaddr_to_sockaddr(), UnDate(), UnDosLine(), UnLslRLine(), UnMDTMDate(), UnMlsT(), updateSvnlog(), URLCopyToken(), RequestHandler::urldec(), UXTHEME_RestoreSystemMetrics(), while(), wined3d_adapter_init_gl_caps(), xmlInitMemory(), and xsltNumberComp(). Referenced by ConCfgReadUserSettings(), ConSrvReadUserSettings(), ConvertNtPathToWin32Path(), CKsProxy::FindPin(), GetDelayMilliseconds(), GROUP_AddGroup(), LoadSettings(), MAIN_CreateMainWindow(), ParseNumber(), ReadPortSettings(), SetupCopyOEMInfW(), Test_ifuncs(), test_wstrdate(), and test_wstrtime(). Referenced by get_subtests(), and run_tests(). Definition at line 3912 of file file.c. Referenced by CCFDATAStorage::Create(), create_temp_binary(), jpeg_open_backing_store(), JSPROXY_InternetInitializeAutoProxyDll(), open_file_test(), patch_file(), test_color_contexts(), test_CreateDirectoryA(), test_CryptCATAdminAddRemoveCatalog(), test_GetNamedSecurityInfoA(), test_install_class(), test_retrieveObjectByUrl(), test_SetupCopyOEMInf(), transfer_file_http(), CCFDATAStorage::Truncate(), VerInstallFileA(), and VerInstallFileW(). Referenced by myfeof(), stdio_istreambuf::pbackfail(), processRegLinesA(), select_file_type(), and stdio_istreambuf::underflow(). Referenced by __report_error(), _vcprintf(), _vwarnx(), adns__vdiag(), chat(), command(), configparseerr(), cxlog(), die(), dprintf(), eprintf(), error(), fprintf(), generic_msg(), isohybrid_error(), isohybrid_warning(), LIBXML_ATTR_FORMAT(), LIBXSLT_ATTR_FORMAT(), log_debug(), logmsg(), msg(), Output(), pdie(), pp_internal_error(), print(), tinyxml2::XMLPrinter::Print(), printf(), PrintF(), unimpl(), unixErrorHandler(), unixWarningHandler(), usageerr(), verr(), verrx(), vprintf(), vwarn(), vwarnx(), warning(), Win32ErrorHandler(), Win32WarningHandler(), wintirpc_debug(), write_line(), xfprintf(), and xmlGenericErrorDefaultFunc(). Referenced by _vcwprintf(), fwprintf(), and vwprintf(). Referenced by DbgPrint(), error_exit(), indent_printf(), ok_func(), ShimDbgPrint(), skip_func(), and xprintf(). Definition at line 930 of file stdio.h. Referenced by EfiPrintf(), and pSetupDebugPrint(). Definition at line 733 of file sprintf.c. Referenced by append_str(), command(), CONSOLE_ConOutPrintfV(), CONSOLE_PrintTextXY(), CONSOLE_PrintTextXYN(), CONSOLE_SetStatusTextAutoFitX(), CONSOLE_SetStatusTextXV(), DbgPrint(), DbgPrintEarly(), debug_printf(), DebugFunction(), dprintf(), Error(), error(), FatalError(), ATL::ChTraitsCRT< char >::FormatV(), fprintfSocket(), KdbpPrintDisasm(), LogMessage(), logmsg(), MUIDisplayErrorV(), ok_(), OpenMsg(), PciIdPrintf(), PciIdPrintfAppend(), printf(), PrintF(), PrintString(), ScsiDebugPrint(), SendCommand(), service_ok(), SetXtermTitle(), sprintf_nt(), Trace(), unimpl(), warning(), Win32DbgPrint(), WINETEST_PRINTF_ATTR(), and wintirpc_debug(). Referenced by BlStatusPrint(), and ATL::ChTraitsCRT< _CharType >::FormatV(). Referenced by LoadAndPrintString(), PrintRow(), and wprintf(). Definition at line 90 of file stdio.h. Definition at line 116 of file stdio.h. Referenced by test_filbuf(), test_fileops(), and test_write_flush_size(). Definition at line 92 of file stdio.h.